In a lot of ways, it was a successful season for the Crook County High School volleyball team. In other ways, the season was a huge disappointment. After moving up to Class 5A this season, the Cowgirls once again reached the final eight and the state volleyball tournament. However, for the first time since 2005, the Cowgirls failed to earn a trophy at the state tournament. "It was a good year," said first-year Crook County head coach Baylee Dunkel. "It was super challenging, me being a new head coach and new to the high school scene. I think that it was the most challenging year that I have ever had as a coach, but it was still a good year." Dunkel, who took over for long-time head coach Rosie Honl, led the Cowgirls to a 20-12 overall record and third place in the Intermountain Conference. Crook County had wins over league rivals Hood River Valley and Ridgeview, who both earned trophies at the state tournament, however, the Cowgirls also lost to both teams down the stretch, as they dropped down the power rankings late in the season. The Cowgirls also made it to the gold bracket in several tournaments and had pool play wins against several strong programs during the course of the season. At the same time, the Cowgirls struggled on occasion, falling to teams that they probably should have beaten. Still, on balance, it was another strong season for the Cowgirls as they showed that even with the move up to Class 5A, they are still a force to be reckoned with. Taking over for a legendary coach is never easy, but Dunkel said that her players helped with the transition. "I looked to my two seniors for pretty much everything," Dunkel said. "With practices and asking them what Rosie had done — how things had been. They helped me immensely. They helped me with my practice plans, and they helped me with the traditions that we wanted to keep going. They really guided me this year." Those two seniors, Mekynzie Wells and Kerigan Waibel, were four-year starters for the Cowgirls. Wells, a libero, battled illness during the season, but continued to play at a high level the entire season, leading the Cowgirl defense and serving as a leader on the floor for the Cowgirls the entire season. Waibel, an outside hitter, went down with a serious knee injury early in the season. However, she continued to come to practice and games, remaining involved with the program. 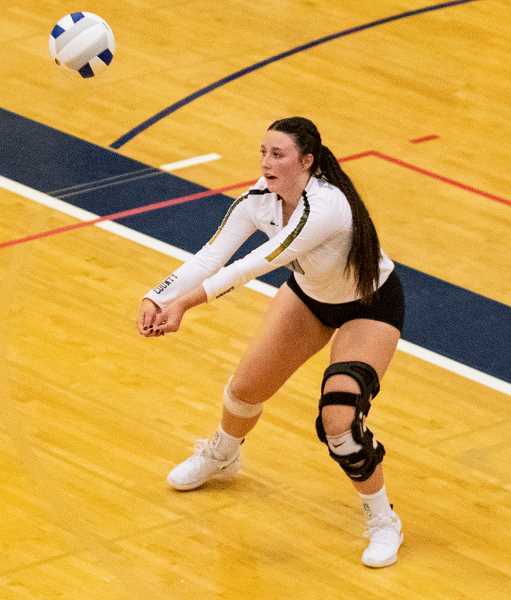 Then, once a custom fitted knee brace was finally finished, Waibel returned to the lineup as a defensive player for the state playoffs, despite missing more than six weeks of the regular season. Several other Cowgirl players also missed matches with either injury or illness, helping explain the up and down nature of the Cowgirls' season. "You always hope that you go in with no injuries, but that wasn't the case for us," Dunkel said. "We battled injuries and illnesses and that sort of thing all year long, so I was just super impressed by the abilities of these high school girls to pull through and play even though they were in pain and even though they had injuries that they probably shouldn't have played with. It wasn't even a question. Once they were cleared, they were back, 100 percent in." Dunkel said that both players will be missed by the program. "I'm super appreciative about both of those girls," she said. Still, with the remainder of the Cowgirl varsity returning, Crook County should still be a strong team next season. Middle blockers Kenna Woodward and Liz Barker return along with outside hitters Raegan Wilkins and Kendall Maykut. Right side hitter Lily Cooper is also back, along with defensive specialists Kacie Stafford and Stormie Camara and setter Anna Woodward. Syrie Ossenkop, Josie Kasberger, Messina McClellan and Rebecca Cooper also saw plenty of varsity experience this season. Dunkel is already preparing for next season. "We need to run a quick offense to be able to compete with these other teams," Dunkel said. "I think that we need to work on some eye work and speeding things up, and then we need to transition into a quick offense so that we are able to throw the other teams off balance and be able to get really good execution." Dunkel added that she will continue to use the same system that Honl used, but that she is changing her focus to work more on the offense aspects of the game. "We are going to work on quickening up our offense," she said. "Speed of play is going to be our focus for next year."